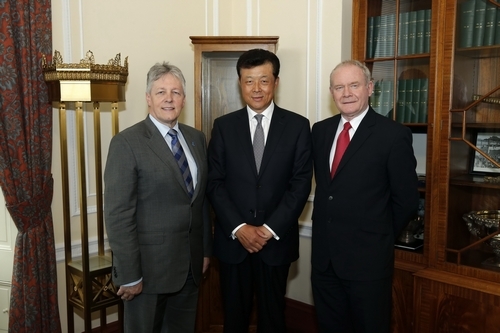 On 20 May 2013, Ambassador Liu Xiaoming met with First Minister Peter Robison and Deputy First Minister Martin McGuinness of Northern Ireland in Belfast of Northern Ireland, UK. Ambassador Liu made a positive summary of the relations between China and Northern Ireland. He said that, in April last year, Liu Yandong, the Chinese State Councilor, chose Northern Ireland as the first stop of her visit to the UK. This may fully embody the importance attached by China on developing the relations with Northern Ireland. In a few days, the First Minister and the Deputy First Minister will visit China together. This will be the first official visit to China by the chief executives of Northern Ireland which will be of great significance for the development of the relations between China and Northern Ireland. Ambassador Liu said, in recent years, outstanding achievements have been made in the cooperation between China and Northern Ireland in fields such as economy, trade, culture and education. Last year, the volume of bilateral trade exceeded 1 billion pounds, a rise of 5.2% over the previous year. Northern Ireland’s export to China grew by 27.8%. China has become an important market for many companies in Northern Ireland. Currently, more than 1000 Chinese students are studying in Northern Ireland, and “Mandarin fervor” and “China fervor” have continued to receive increasing attention in Northern Ireland. Queen’s University of Belfast and the University of Ulster are currently launching cooperation in productive teaching and scientific research programmes with a number of Chinese universities. Ambassador Liu pointed out that Northern Ireland enjoys beautiful natural scenery, rich culture, outstanding scientific research ability, and a number of strengths in machinery manufacturing, farming and animal husbandry. In addition, the increasing political stability and good environment of social security are also favorable conditions for Northern Ireland to develop cooperative relations with China. China is willing to work together with Northern Ireland to enhance mutual understanding, deepen cultural and bilateral friendly exchanges and improve the levels of cooperation in order to be constantly enhancing the friendly and mutual beneficial relations between the two sides which will contribute to the development of China-UK relations. First Minister Peter Robison and Deputy First Minister Martin McGuinness said that the relations between Northern Ireland and China in recent years have developed in leaps and bounds. Currently, in addition to the fruitful cooperation between the enterprises and universities on both sides, more and more Chinese tourists have also set foot on Northern Ireland soil. The Titanic Centre Belfast built last year has received more than 4,000 Chinese tourists. As a result, the Centre has especially printed tourist brochures in Chinese. The government and parliament of Northern Ireland have attached significant importance to developing their relations with China. They were looking forward to their first official visit to China at the end of May, hoping that this visit may be a complete success, expand Northern Ireland’s popularity and influence in China and facilitate the pragmatic cooperation between the two sides in economy, trade, education, culture, tourism and other sectors. Mr. Li Ruiyou, Chinese Consul-General in Edinburgh and other local officials were also present at the meeting.